Inflation hysteria was as much crude oil as anything else. 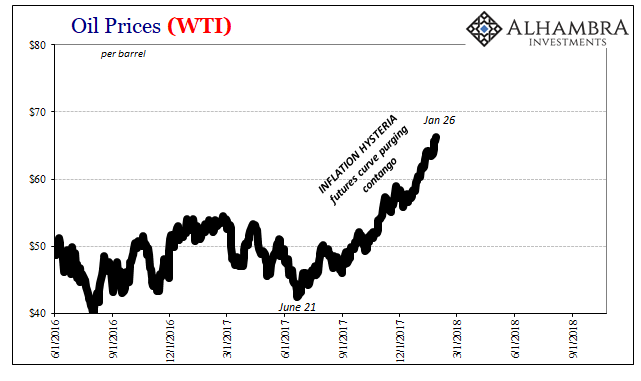 After all, it was the sudden spike higher in oil prices that would eventually push the US CPI, PCE Deflator, Europe’s HICP, and even Japan’s moribund inflation index. Central bankers were giddy, as was mainstream commentary extrapolating these trajectories into actual economic acceleration. For a time, even the unbreakable skepticism of the global bond market was set aside. If there was to be something real behind globally synchronized growth, oil sure would have pointed the way. After the economic disaster of 2015-16, demand not crude supply glut, for economic normalcy to be possible for the first time in a decade the energy sector would first have to reset. It did, enthusiastically. 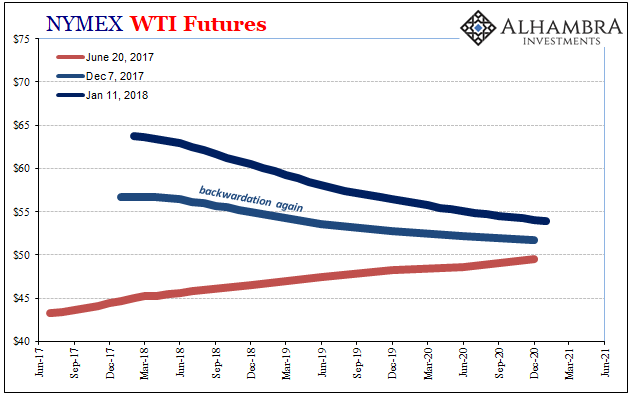 Contango was purged from the futures curve indicating that supply and demand for oil was equalizing. Since it hadn’t been a supply glut, rising demand was as visible as it was welcoming. Markets ran into a bit of a bump in the road to globally synchronized growth in late January. On January 29, stocks were liquidated and the whole global economy shook from the earthquake (in global money, not the share liquidations which merely registered one effect). There would be another perhaps greater aftershock on May 29. The oil patch, however, appeared unconcerned at least in terms of oil prices and backwardation. Crude benchmarks continued to rise despite growing nervousness elsewhere. 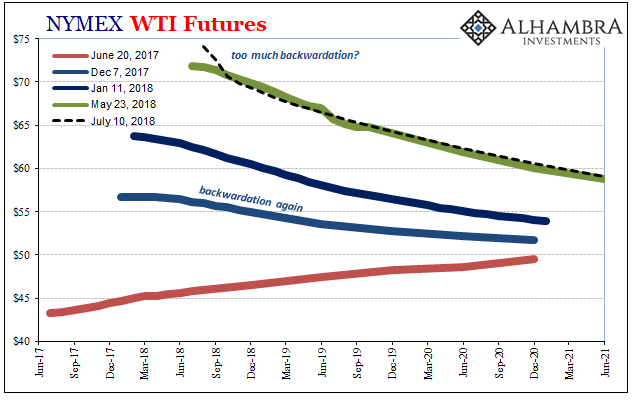 And backwardation would by July become extreme. The Commitment of Traders (COT) report tells a little different story behind all that. The futures market did not ignore January 29. Rather, the oil space processed the unfolding deflation a little differently at least as far as timing. Money Managers had been record long, by a long shot, the week of January 30. The bet on globally synchronized growth was intense, the market corroboration of the coming global recovery the world sorely needed; central bankers most of all for reasons of inflation.